Adam Greenhalgh, “Edward Hopper/Ground Swell/1939,” American Paintings, 1900–1945, NGA Online Editions, https://purl.org/nga/collection/artobject/131206 (accessed April 24, 2019). Edward Hopper’s lifelong enthusiasm for the sea developed when he was a boy in Nyack, New York, then a prosperous Hudson River port with an active shipyard. Years later, in 1934, he and his wife built a house and studio in South Truro, Massachusetts, where he produced a number of oil paintings and watercolors manifesting his avid interest in nautical subjects. Despite its bright palette and seemingly serene subject, Ground Swell echoes the themes of loneliness and escape typical of Hopper's oeuvre. The blue sky, sun-kissed figures, and vast rolling water strike a calm note in the picture; however, the visible disengagement of the figures from each other and their noticeable preoccupation with the bell buoy placed at the center of the canvas call into question this initial sense of serenity. The lone dark element in a sea of blues and whites, the buoy confronts the small catboat in the middle of an otherwise empty seascape. Its purpose, to emit a warning sound in advance of unseen or imminent danger, renders its presence in the picture ominous. The cirrus clouds in the blue sky—often harbingers of approaching storms—reinforce this sense of disturbance in the otherwise peaceful setting. Although Hopper resisted offering explanations of his paintings, the signs of impending danger here may also reference a more severe disturbance: during the time that Hopper worked on Ground Swell, from August to September 15, 1939, World War II broke out in Europe. This entry is a revised version of text that was originally published in Corcoran Gallery of Art: American Paintings to 1945, ed. Sarah Cash (Washington, DC, 2011). Under feathery cirrus clouds and a brilliant blue sky, the boat’s three passengers and pilot gaze at, and presumably listen to, the buoy’s bell, which tilts toward them as it crests one of a sequence of rolling waves. Although Edward Hopper is renowned for lonely urban scenes that have led his work to be understood as emblematic of the mood of the modern city and the isolation of its inhabitants, he was also a dedicated painter of nautical subjects. On the connection between Hopper’s enthusiasm for nautical subjects and his “love of solitude,” see Gail Levin, Edward Hopper: The Art and the Artist (New York, 1980), 42. Nicolai Cikovsky Jr., “Breezing Up (A Fair Wind),” in Franklin Kelly et al., American Paintings of the Nineteenth Century, part 1, The Collections of the National Gallery of Art Systematic Catalogue (Washington, DC, 1996), 314. On the comparison with Eakins, see John Wilmerding, A History of American Marine Paintings (Salem, MA, and Boston, 1968), 245. 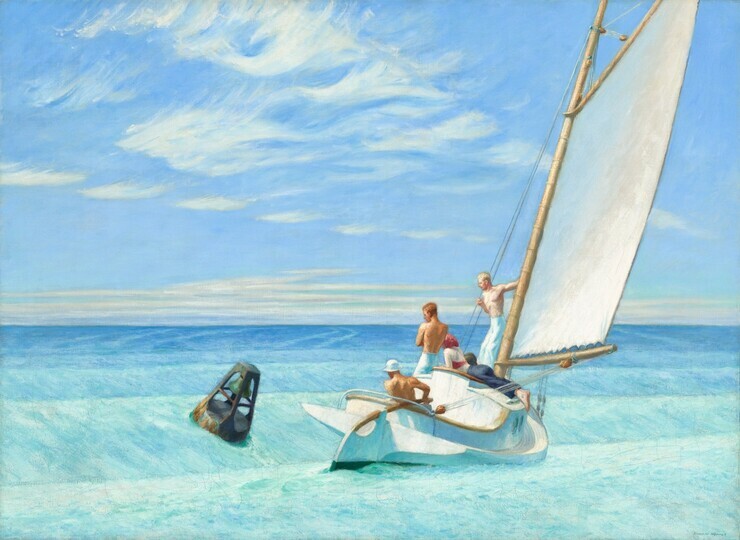 Whereas Homer’s sailors gaze intently at a clear horizon connoting future promise, Hopper’s are transfixed by the bell buoy, which strikes a dark note, literally and figuratively, in the otherwise sunny scene. Fourteen preparatory sketches for Ground Swell are extant. Four of these include roughly delineated cloud patterns, and one is a highly detailed cloud study (Whitney Museum of American Art, Josephine N. Hopper Bequest, acc. no. 70.856). Hopper to Pène du Bois, Aug. 11, 1940, Guy Pène du Bois Papers, reel 28, Archives of American Art, Smithsonian Institution, Washington, DC. The artist’s canvas, like the catboat’s white canvas sail, seemingly offered a means of escape. Hopper had won the first William A. Clark Prize of $2,000 and a Gold Medal from the Fifteenth Biennial Exhibition of Contemporary American Oil Paintings at the Corcoran Gallery of Art in 1937 for Cape Cod Afternoon (1936, Carnegie Museums of Pittsburgh). lower right: EDWARD HOPPER; on reverse of frame: frame made for / Edward Hopper by / Carl Sandelin framemaker / 133 E 60th St NYC. (Frank K.M. Rehn Gallery, New York); purchased 1943 by the Corcoran Gallery of Art, Washington; acquired 2014 by the National Gallery of Art. The painting was purchased from the Corcoran's 1943 Eighteenth Biennial Exhibition of Contemporary American Oil Paintings. Second Biennial Exhibition of Contemporary American Paintings, Virginia Museum of Fine Arts, Richmond, 9 March - 21 April 1940, no. 93, repro. Survey of American Painting, Department of Fine Arts, Carnegie Institute, Pittsburgh, 24 October - 15 December 1940, no. 329, pl. 121. The Cranbrook-Life Exhibition of Contemporary American Painting, Cranbrook Academy of Art, Cranbrook Museum, Bloomfield, Michigan, 17 May - 2 June 1940, unnumbered catalogue, repro. Eighteenth Biennial Exhibition of Contemporary American Oil Paintings, Corcoran Gallery of Art, Washington, 21 March - 2 May 1943, no. 98. Sport in American Art, Museum of Fine Arts, Boston, 10 October - 10 December 1944, no. 69, repro. Sports and Adventure in American Art, Milwaukee Art Institute, 15 February - 30 March 1947, no catalogue. The Coast and the Sea, a Survey of American Marine Painting, Brooklyn Museum, 19 November 1948 - 16 January 1949, no. 64, repro. By the Sea [15-venue tour organized by the Museum of Modern Art, New York], first 7 venues did not include Ground Swell; Washington Workshop, Washington, D.C.; Rhode Island League for Arts and Crafts, Providence; Pennsylvania College for Women, Pittsburgh; Quincy Art Club, Illinois; Currier Gallery of Art, Manchester; Hamline University, St. Paul; Albion College, Michigan; State Teachers College, Potsdam, New York, 14 September 1950 - 7 June 1951, no catalogue. Edward Hopper Retrospective Exhibition, Whitney Museum of American Art, New York; Museum of Fine Arts, Boston; Detroit Institute of Arts, 11 February - 2 July 1950, no. 52, pl. 20. Judge the Jury, Virginia Museum of Fine Arts, Richmond, 13 February - 22 March 1953, no catalogue. Sport in Art from American Collections Assembled for an Olympic Year, Time and Life Building Reception Hall, New York; Museum of Fine Arts, Boston; Corcoran Gallery of Art, Washington; J.B. Speed Art Museum, Louisville; Dallas Museum of Fine Arts; Denver Art Museum; Los Angeles County Museum of Art; California Palace of the Legion of Honor, San Francisco; Dayton Art Institute, 31 October 1955 - 28 October 1956, no. 53, repro. Edward Hopper, Whitney Museum of American Art, New York; Art Institute of Chicago; Detroit Institute of Arts; City Art Museum of St. Louis, 29 September 1964 - 9 May 1965, no. 36, repro. Sao Paolo 9: United States of America / Estados Unidos da America, Edward Hopper [and] Environment U.S.A., 1957-1967, Museum of Modern Art, Sao Paulo; Rose Art Museum, Brandeis University, Waltham, Massachusetts, 22 September 1967 - 24 March 1968, no. 21. Edward Hopper: Fifteen Paintings, Newport Harbor Art Museum, Newport Beach; Pasadena Art Museum, 12 January - 23 April 1972, no catalogue. Corcoran [The American Genius]. Corcoran Gallery of Art, Washington, 24 January - 4 April 1976, unnumbered catalogue, repro. Americans at Work and Play, 1845-1944, University Art Museum, University of Texas at Austin, 6-20 March 1980, no. 36, repro. Guy Pène du Bois: Artist About Town, Corcoran Gallery of Art, Washington; Joslyn Art Museum, Omaha; Mary and Leigh Block Gallery, Northwestern University, Evanston, 10 October 1980 - 10 May 1981, no. 98, repro. Of Time and Place: American Figurative Art from the Corcoran Gallery, Corcoran Gallery of Art, Washington; Cincinnati Art Museum; San Diego Museum of Art; University of Kentucky Art Museum, Lexington; Hunter Museum of Art, Chattanooga; Philbrook Art Center, Tulsa; Portland Art Museum, Oregon; Des Moines Art Center; Museum of Fine Arts, St. Petersburg, Florida, 23 September 1981 - 21 May 1983, no. 54, repro. Edward Hopper, Musée Cantini, Marseille; Fondation March, Madrid, 23 June 1989 - 4 January 1990, unnumbered catalogue, repro. The Forty-Fifth Biennial: The Corcoran Collects, 1907-1998, Corcoran Gallery of Art, Washington, 17 July - 29 September 1998, unnumbered checklist, repro. Encouraging American Genius: Master Paintings from the Corcoran Gallery of Art, Corcoran Gallery of Art, Washington; Museum of Fine Arts, Houston; Parrish Art Museum, Southampton; Mint Museum of Art, Charlotte; John and Mable Ringling Museum of Art, Sarasota, 27 August 2005 - 29 April 2007, checklist no. 93. Edward Hopper, Museum of Fine Arts, Boston; National Gallery of Art, Washington, 6 May 2007 - 11 May 2008, no. 74, repro. Hopper, Museo Thyssen-Bornemizsa, Madrid, 12 June 2012 - 28 January 2013, no. 47, repro. A checklist and the itinerary of the exhibition tour are in the Archives of the Museum of Modern Art, New York: CEII.I/43/(2); copies in NGA curatorial files. Virginia Museum of Arts, Richmond: Official Record of Receipt, 21 January 1953; copy in NGA curatorial files. Wiles's report is in NGA conservation files. In addition, Lance Mayer prepared a comprehensive technical summary for Corcoran Gallery of Art: American Paintings to 1945, ed. Sarah Cash (Washington, DC, 2011). A copy of this summary is also available in NGA conservation files. "A Remarkable Exhibition of Italian Paintings." Richmond Times-Dispatch (24 February 1940). Cottrell, Ann. "2 Unknown Win Medals in Biennial." Richmond Times-Dispatch (10 March 1940): 18. "Here, There, Elsewhere." New York Times (10 March 1940): 160. Berryman, Florence S. "Corcoran Art Gallery's Biennial Exhibition [exh. review]." The Washington Sunday Star (21 March 1943): E:5. "Corcoran Gallery Buys Work of Seven American Artists [exh. review]." The Washington Evenig Star (18 March 1943): 2. The Poe Sisters. "Corcoran Art Preview Here Draws Crowd [exh. review]." Washington Times Herald (21 March 1943): B:1. Watson, Jane. "Corcoran Show, Although Small, Displays Freshness and Spirit [exh. review]." The Washington Post (21 March 1943): L4. J. D. M. "Sport in American Art: Boston Show is 'Big League Stuff' to Sports Writers." Magazine of Art 37 (December 1944): 297 repro. Edward Hopper. American Artists Group Monograph no. 8. New York, 1945: n.p., repro. Corcoran Gallery of Art. Handbook of the American Paintings in the Collection of the Corcoran Gallery of Art. Washington, 1947: 83. Goodrich, Lloyd. Edward Hopper. Harmondsworth, England, 1949: pl. 20. Aldow, Dorothy. "Edward Hopper, Yankee Classicist [exh. review]." Christian Science Monitor (25 February 1950): 12. "Edward Hopper: Famous American Realist has Retrospective Show." Life 28, no.16 (17 April 1950): 104, 105 repro. "News of Art and Artists [exh. review]." Washington Star (1 October 1950): C:3. Tyler, Parker. "Hopper/Pollock: The Loneliness of the Crowd and the Loneliness of the Universe: An Antiphonal." Art News Annual 26 (1957): 95, 98-99 repro. New York Graphic Society. Reproductions of American Paintings. New York, 1962: 95 under no. 6004, repro. Stevens, Elisabeth. "A Nosegay of 19th Century Art." The Washington Post (27 June 1965): G:7. Wilmerding, John. A History of American Marine Painting. Salem, Massachusetts, 1968: 37 repro., 42. Goodrich, Lloyd. Edward Hopper. New York, 1971: 120, repro. 125. Phillips, Dorothy W. A Catalogue of the Collection of American Paintings in the Corcoran Gallery of Art, Vol. 2: Painters born from 1850 to 1910. Washington, 1973: 113-114, repro. 113. Matusovskaia, Elena Mikhatovna. Edward Hopper. Moscow, 1977: pl.16. Young, Mahonri Sharp. American Realists: Homer to Hopper. New York, 1977: 198 repro. Levin, Gail. Edward Hopper: The Art and the Artist. Exh. cat. Whitney Museum of American Art, New York; Hayward Gallery, London; Stedelijk Museum, Amsterdam; Städtische Kunsthalle, Düsseldorf; Art Institute of Chicago; San Francisco Museum of Modern Art, 1980-1982. New York, 1980: 43, pl. 185. Stein, Susan Alyson. "Hopper: The Uncrossed Threshold." Arts 54 (March 1980): 150 repro., 160. Weyergraf, Bernd. "Licht von der Seite und Eyes Examined: Hopper und Marsh." Amerika: Traum und Depression, 1920/40. Exh.cat. Akademie der Kuenste, Berlin, 1980: 154 repro. Levin, Gail. "Hopper's America." Bijutsu Techo 33 (March 1981): 164 repro. Baur, John I. H. American Masters of the Twentieth Century. Exh. cat. Oklahoma Art Center, Oklahoma City, 1982: 60. Levin, Gail. Twentieth-century American Painting. The Thyssen-Bornemisza Collection. London, 1987: 209. Wilmerding, John. American Marine Painting. Rev. ed. of A History of American Marine Painting, 1968. New York, 1987: 179 repro., 180. Falk, Peter Hastings, ed. The Biennial Exhibition Record of the Corcoran Gallery of Art, 1907-1967. Madison, Connecticut, 1991: 154. Little, Carl. Edward Hopper's New England. San Francisco, 1993: pl. 19. Kranzfelder, Ivo. Edward Hopper, 1882-1967: Vision der Wirklichkeit. Cologne, 1994: 106 repro. Constantino, Maria. Edward Hopper. Greenwich, 1995: 82, 83 repro. Levin, Gail. Edward Hopper: A Catalogue Raisonné. 4 vols. New York, 1995: 1:83; 3:266, 267 repro. Levin, Gail. Edward Hopper: An Intimate Biography.1st ed. New York, 1995: 314-315, 360, 426. Burchard, Hank. "Corcoran Biennial: A Retreat in Reverse [exh. review]." The Washington Post (7 August 1998): N: 55, repro. Dorsey, John. "Framing the Century: Corcoran Gallery Highlights the Best Works from Its Forty-four Biennials [exh. review]." Baltimore Sun (3 September 1998): F:3, repro. Gedzelman, Stanely David. "Sky Paintings: Mirrors of the American Mind." Weatherwise 51 (January/February 1998): 65 repro. Kilian, Michael. "Corcoran Exhibit Traces Art's Meanderings." Chicago Tribune (23 August 1998): 3. Lewis, Jo Ann. "The Corcoran Biennial: Delivery on Collection [exh. review]." Washington Post (19 July 1998): G:1. Shaw-Eagle, Joanna. "For Corcoran, 'Forty-Fifth' is the No.1 Exhibit [exh.review]." The Washington Times (26 July 1998): D:1, repro. Simmons, Linda, et al. The Forty-fifth Biennial: The Corcoran Collects, 1907-1998. Exh. cat. Corcoran Gallery of Art, Washington D.C., 1998: cover, 47 repro. Mecklenburg, Virginia M. Edward Hopper: The Watercolors. Exh. cat. National Museum of American Art, Washington D.C., 1999: 141, 161. Stephen, May. "The Old and the Beautiful." Art News 98, no.7 (Summer 1999): 36. Cash, Sarah, with Terrie Sultan. American Treasures of the Corcoran Gallery of Art. New York, 2000: 185, repro. Smeaton, Suzanne. " On the Edge of Change: Artist-Designed Frames from Whistler to Marin." In The Gilded Edge: The Art of the Frame. Edited by Eli Wilner. San Francisco, 2000: 70, 80 repro. Coyle, Laura, and Dare Myers Hartwell, eds. Antiquities to Impressionism: The William A. Clark Collection, Corcoran Gallery of Art. Washington, DC, 2001. Strand, Mark. Hopper. New York, 2001: 22 repro., 23, 25. Moss, Dorothy. "Ground Swell." In A Capital Collection: Masterworks from the Corcoran Gallery of Art. Edited by Eleanor Heartney. London, 2002: 109, 110 repro. May, Stephen. "Edward Hopper's Maine." Portland Magazine (July-August 2004): 36-37, repro. Ernst, Eric. "American Classics, Up Close and Personal [exh. review]." Southampton Press (6 July 2006): B:1, B:7. Genocchio, Benjamin. "Thrilling and Hypnotic: Masterworks with Major Impact [exh. review]." The New York Times (11 June 2006): 12 repro. Goodrich, John. "Museums: Travelling Icons of American Art [exh. review]." The New York Sun (6 July 2006): 16. "Hopper Work is Subject to Talk." Southampton Press (22 June 2006): B:8. Lerner, Mark. "Hopper's 'Ground Swell,' Awash in Neglect." The Washington Post (1 January 2006): 5. "Mint Museum to Host Master Paintings from the Corcoran Gallery." Antiques and the Arts Weekly (6 October 2006): 17 repro. Shinn, Susan. "Viewing Masters: 'Encountering American Genius: Master Paintings from the Corcoran Gallery of Art' Opens at the Mint [exh. review]." Salisbury Post (12 October 2006): D:7, repro. Bennett, Lennie. "The Coming of Age of American Art [exh. review]." St. Petersburg Times (18 February 2007): 9L repro. Gopnik, Blake. "Edward Hopper and the Rising Tide of War- Wide Angle: Dissecting 'Ground Swell'." The Washington Post (18 November 2007): M:1, 8-9 repro. Matheny, Lynn K. "Edward Hopper." American Art Review 19, no. 5 (September-Ocotber 2007): 169 repro. Nemerov, Alexander. "Ground Swell: Edward Hopper in 1939." American Art 22, no. 3 (Fall 2008): 50-71, color repros. cover, 50-51; color figs. 12, 14. Pittura Americana del XIX secolo. Exh. cat. Museo di Santa Giulia, Brescia, Italy, 2008: 225 repro. Strand, Mark. Hopper. Barcelona, 2008: 50-52, 51 repro., 54, 111, 114. Greenhalgh, Adam. "Edward Hopper, Ground Swell." In Corcoran Gallery of Art: American Paintings to 1945. Edited by Sarah Cash. Washington, 2011: 248-249, 282-283, repro. Little, Carl. Edward Hopper's New England. San Francisco, 2011: 17, 56, 57 repro. Marco Goldin. Van Gogh and Gauguin's Journey: Variations on a Theme. Translated by David Kerr. Exh. cat. Palazzo Ducale, Genoa, 2011: 162, 163 repro. Strand, Mark. Hopper. New York, 2011: 26, 27 repro. Lipiński, Filip. Hopper wirtualny: Obrazy w pamiętającym spojrzeniu. Ph.D. dissertation, Uniwersytet Adam Mickiewicz, Poznań, 2013. Toruń, 2013: 404, 523, 615, color fig. 179. Beaux Arts Magazine no. 373 (July 2015): cover, table of contents, guide insert. Hopper’s earliest-known oil painting depicts a rowboat in a secluded cove; see Gail Levin, Edward Hopper: A Catalogue Raisonné, 3 vols. (New York, 1995), 3:1, no. 0-1. 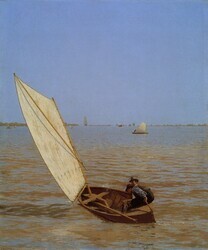 His first sale, furthermore, from the Armory Show of 1913, which showcased developments in avant-garde European and American modern art, was a marine subject, Sailing (1911). For Hopper’s biography, see Gail Levin, Edward Hopper: An Intimate Biography (New York, 2007). Gail Levin, Edward Hopper: A Catalogue Raisonné, 3 vols. (New York, 1995), 1:83. Susan Alyson Stein, “Hopper: The Uncrossed Threshold,” Arts Magazine 54 (March 1980): 156–160. Nicolai Cikovsky Jr., “Breezing Up (A Fair Wind),” in Franklin Kelly et al., American Paintings of the Nineteenth Century, part 1, The Collections of the National Gallery of Art Systematic Catalogue (Washington, DC, 1996), 314. On the comparison with Eakins, see John Wilmerding, A History of American Marine Paintings (Salem, MA, and Boston, 1968), 245. The author thanks Stanley David Gedzelman, professor of earth and atmospheric sciences, City College of New York, for discussing Hopper’s cloud formations. See Gedzelman, “Sky Paintings: Mirrors of the American Mind,” Weatherwise 51 (Jan.–Feb. 1998): 65. Alexander Nemerov, “Ground Swell: Edward Hopper in 1939,” American Art 22, no. 3 (Fall 2008): 57. Alexander Nemerov, “Ground Swell: Edward Hopper in 1939,” American Art 22, no. 3 (Fall 2008): 50–71. Hopper to Pène du Bois, Aug. 11, 1940, Guy Pène du Bois Papers, reel 28, Archives of American Art, Smithsonian Institution, Washington, DC. Committee on Works of Art and the Art School, Report to the Board of Trustees,” April 16, 1943, Corcoran Gallery Board of Trustees Meeting Minutes, Cor.RG01, Corcoran Gallery Board of Trustees records, 1884–2014, box 2008.006, Special Collections Research Center, George Washington University Libraries. “Committee on Works of Art and the Art School, Report to the Board of Trustees,” April 16, 1943, Corcoran Gallery Board of Trustees Meeting Minutes, Cor.RG01, Corcoran Gallery Board of Trustees records, 1884–2014, box 2008.006, Special Collections Research Center, George Washington University Libraries. It is known that the ground was commercially pre-primed because it extends over all of the tacking margins.